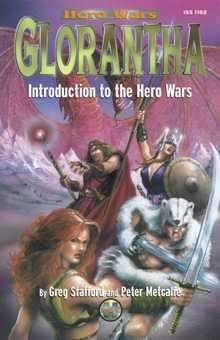 Glorantha is a gigantic cube awash in a limiltess ocean, formed by the collision of four forces in primordal eras. It's a world alive with adventure and magic where gods are plentiful and magic real. The realms of power, spirits, gods, and myth are as tangible as the kingdoms of men. It's the home of heroes and monsters, empires and dragons, and of everyday people trying to preserve their way of life. "A world of adventure awaits you; are you brave enough to face the gods to remake the world?" This title was added to our catalog on July 17, 2006.